The blogger navigation bar is showing top of your site/blog. you are signed into your blogger account, write your posts, so this bar is helpful to you. 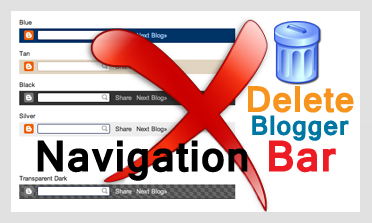 many blogger users don't like "navigation bar" there to many reasons. Why Should We Remove this Bar? This bar doesn't look good to blog/website. The Navigation-bar not visually appealing it has ancient 19th century looks and not fully ruins your blog/website look. Now I will show you How to Remove the Blogger "Nav-bar" for your blogger blog, To fill out delete the space of the nav-bar area. How to remove the blogger nav - bar. 1: Go to your site >>> Template <<<. 2: Now click >>> Edit HTML >>> Button. 3: And search the ]]></b:skin> tag to your template coding. 4: Paste below code, just above ]]></b:skin> and press "Save Template" button.